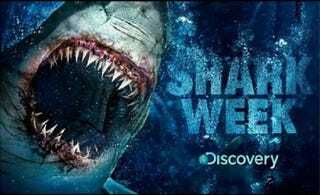 This Week's TV: How Terrible Will Shark Week Be This Year? What’s on TV this week? Werewolves, lions, and interplanetary nuns! It’s also Shark Week, so brace yourselves for more terrible shark science. Also: The Strain and Dominion return for their new seasons. All this and Mark Hamill, on this week’s TV! Close the beaches, because Shark Week is kicking things off with a documentary referencing a Bloodhound Gang single from the Scary Movie soundtrack. Can’t say I’m not intrigued! Hunting for glow-in-the-dark sharks! Skyrocket Toys makes a pretty good one, actually. It’s called “Illumivor”. Join Eli Roth each night this week at eleven for the only shark-specific talk show on television. Guests include shark researchers Paul Clerkin and Kevin O’Donnell, filmmaker Kevin Smith, and special make-up effects artist, Greg Nicotero. The “villain awoken from hibernation” is Mark Hamill, making his debut as Arnim Zola— the Nazi-torso-television. Set that DVR, now! The second (and second best) murder mystery procedural of the year on the sensitive subject of brain-jacking the recently deceased. Documentary about the search for “Joan of Shark”, the largest female Great White ever tagged. AMC is also wisely airing Jaws II earlier the same day. It’s at 3:00PM. This episode is called “Fight or Flight”, and if you missed last week: Nonso Anozie has been kidnapped by a pride of lions! Ghostface has returned; podcasters take notice. The Scream franchise takes on Serial, in “Hello, Emma”. Shark Week goes to Cuba! Filmmaker Dave Riggs searches for the “super predator” off the coast of Australia responsible for eating a 9-foot Great White. Mosasaurus? Orca?! Dr. Robert Bolton and his partner Dr. Luther Paradigm create a machine known as the “gene-slammer”, capable of—No! It’s a documentary on six shark species with unique adaptations. Jawesome! This episode is called “eps1.2_d3bug.mkv”. The network’s official synopsis is, also, agreeably metatextual. Those duplicitous Gemini wives show up to ruin the group dynamic! Could they be as two-faced as the name implies? The Most Dangerous Game is BEAST. Mondo squalo! Sharks from around the world. The episode is titled “Sick City”, after one of Manson’s most popular and enduring songs. Rahm’s siege continues in “Where the Apples Fell”. Researchers set out to tag aggressive sevengill sharks. Seven. Gills. The Killjoys battle nuns with guns over the life of a pregnant girl. It’s the Canadian Fury Road! Great Whites inch perilously closer to Australia’s shores. Strange summons a giant, gripping hand of mud! After seven deaths in four years, Reunion Island has become the most dangerous place on Earth for shark attacks. Last chance to advance! Round of 16, Part II— as always, the smart money is on the wedge. We may be in the midst of a sixth extinction, but we’re just three episodes into Humans. The crew face Another Kind of Blues against UK Subs. The final season returns with 5x03, “Hatchlings”. “Eph and Nora work on a biological weapon to kill the strigoi, and Setrakian risks the lives of the entire group to find information about a closely guarded secret text. The Master begins the next phase of his own plan by creating a terrifying new breed of creature and placing them under Kelly’s control.